Paper transaction slips issued in the retail industries are expensive, impractical and outdated. They pollute the environment, fade over time, get lost and are an irritation to everybody. Retailers are wasting millions on issuing paper slips. EcoSlips converts ordinary paper slips into digital, eco-friendly transaction slips. The system integrates with Point-of-Sale and other transactional systems to convert and send EcoSlips to customer cell phones. Paper slips will soon be something of the past and digital, eco-friendly transaction slips the new norm. •	Transaction slips cluttering their pockets, handbags and cars when they’re out shopping. •	Proof of payments are getting lost or misplaced. •	Paper transaction slips fade over time and become unreadable. •	Effort and frustration when processing transaction slips for tax and medical claim purposes. Paper slip waste, trees cut down to produce paper, printing expenses to retailers. One large retailer in South Africa spends more than 80 million rand per year just on paper transaction slips. 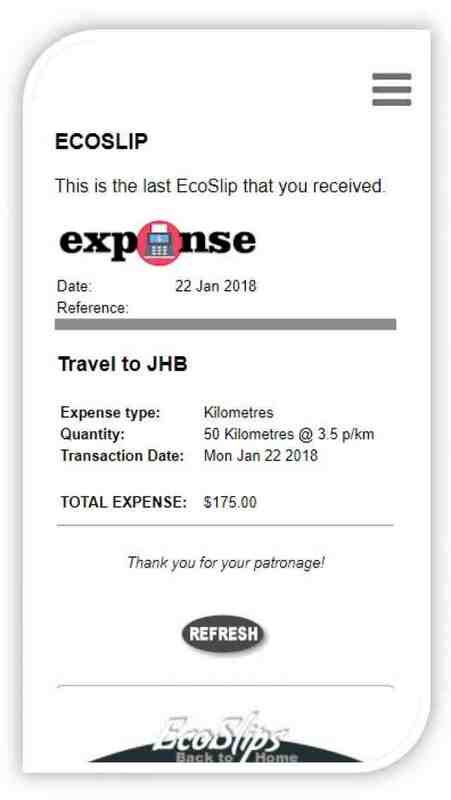 With EcoSlips all your cash slips, medical receipts and other proof of payments are readily available in the Cloud 24/7. When you need them, click one button and receive a neatly formatted report via email in a matter of seconds. 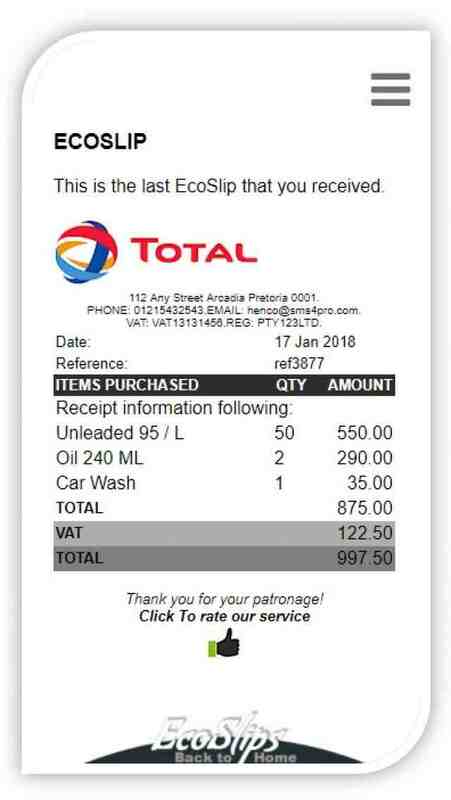 EcoSlips converts ordinary paper slips into digital, eco-friendly transaction slips. Use it to store a proof of payment, send prescriptions to pharmacies and submit business expense claims to employers. An EcoSlip may consist of a scanned receipt, expense claim, screen clip or any other electronic message that can be sent by retailers, pharmacies or even from your own computer. 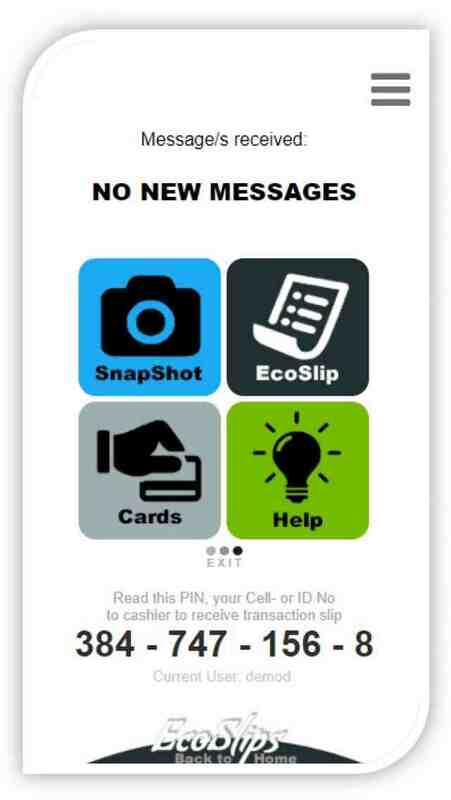 You may create EcoSlips manually on your phone or participating retailers can send digital slips to your phone when you provide them with a unique PIN number. 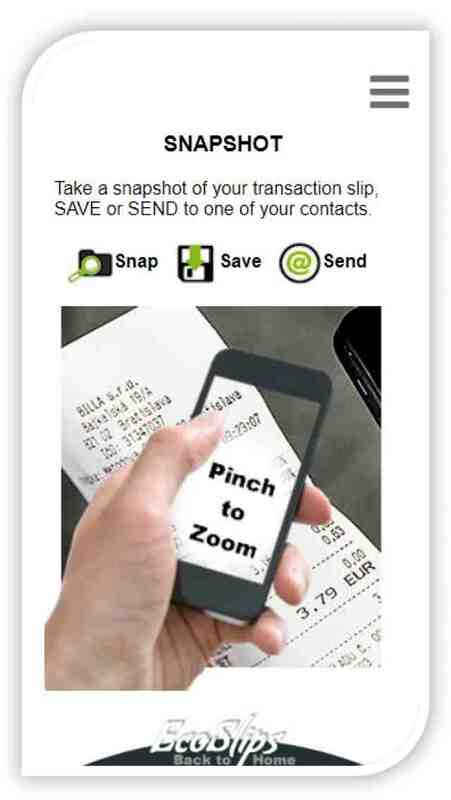 •	Take a snapshot of any paper slip or receipt and store it online where it is always available from any location. 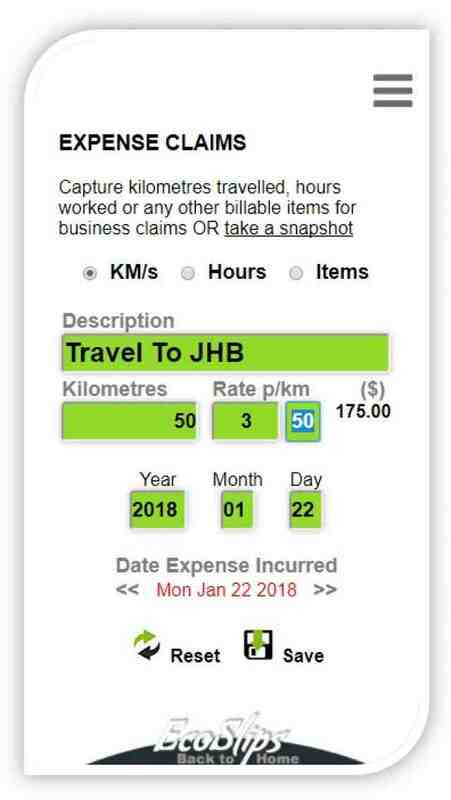 •	Capture expense items, such as kilometres travelled, hours worked and items produced and send them in a neatly formatted report to your employer. •	Take a snapshot of your prescription while you're still at the doctor's consulting room and send it to almost any pharmacy in SA. Pharmacies can reply with a free confirmation message when the medicine is ready to collect. You may also send repeat prescriptions. If a pharmacy is not yet listed, their contact details can be added manually. •	Store all you shopping-, membership- and loyalty card numbers in the app so that they're always available wherever you are. Cards from your medical aid, retailers (Makro, Edgars, Woolworths, etc) can all be stored in the app. We also provide a free desktop application to capture snippets or screen shots from your computer screen and send them to any EcoSlips enabled phone. Send tickets, directions, maps, contact details, addresses and any other useful information easily from your computer to your cell phone where its available all the time, at any location! Seasoned, Togaf certified, Enterprise/Solutions Architect with 20 years development and system integration experience on web application technologies. Implemented various large-scale projects successfully for government and blue-chip organisations. (SA Election Results 2004, Census Management 2011, SAICA Integration Architecture 2016 and other business applications). Awards for previous innovation projects include Best SMS application (Vodacom/Clickatell), MTN App of the Year (EcoSlips) and Fuel Theft tracking system (FuelCop/Automechanics).